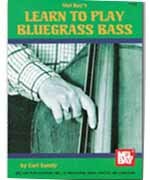 At last, here is a method book for the upright string bass or 'dog house bass' as it is affectionately known in bluegrass circles. Although bluegrass bass has a style of its own, the knowledge gained through this method is applicable to virtually any musical genre. This book addresses the elements of tuning, hand positions, essential chord theory, slap bass technique, and playing in positions 1-10. A handy chart is provided for transposing chord progressions from one key to another. Written in standard notation only.